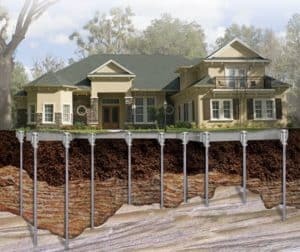 The method of providing a new foundation underneath an existing foundation without disturbing its stability is known as underpinning. 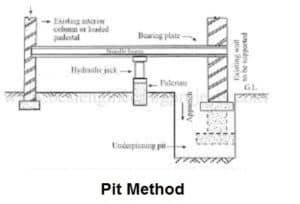 Underpinning is necessarily adopted to replace a defective foundation or to increase the strength of an existing foundation which enables the load conveying limits. To replace a defective foundation into a new foundation. To increase the strength of an existing foundation. To increase the load carrying capacity of a structure. In this method, short length columns of 1.2 m to 1.8 m are underpinned. First, holes are cut in the wall above the ground level at common intervals and strong needles are then inserted through the holes to carry the entire load of the structure. Generally, the needles are made of timber beam or steel joist. In case of RSI beams, wooden bearing plates are used between the beams and supporting wall to minimize the masonry crushing. Jacks are provided to support the needle beams. Jacks should be placed sufficiently away from the supporting walls to enable the working space for trench excavation and concreting. When a foundation is required to be replaced, the section of the wall should be cut in 90 cm – 120 cm in length for new work to be built. Again, cut the next 90 cm to 120 cm length of the wall and rebuilt. Thus the wall foundation can be replaced. In this process, concrete piles are pushed on the both sides of the wall. 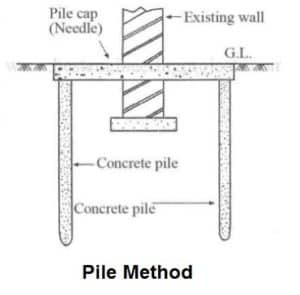 The needle beams are then used over the piles through the wall, where the needle beams act as pile caps. It alleviates the load from the wall. This strategy is helpful for water logged soils where walls convey heavy loads. In this situation piles and needle beams turn into a perpetual part of the establishment and existing foundation of the walls are not disturbed. Underpinning, such a good info.